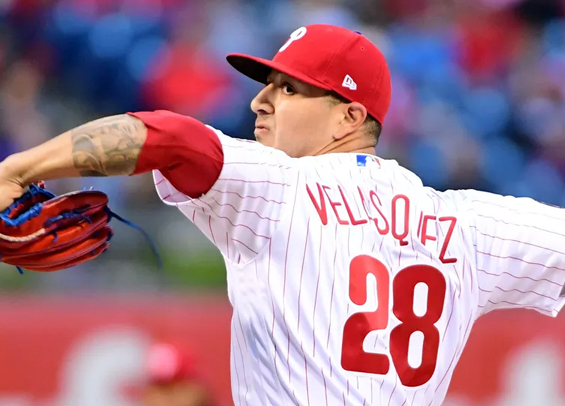 Vince Velasquez continued his streak of dominance on Friday night at Citizens Bank Park as the Phillies defeated the Marlins, 5-1, for their third consecutive victory. Velasquez was masterful at times, leaving with one out in the seventh after surrendering just two hits. He struck out seven and carried a no-hitter into the fifth inning. He also succeeded at the plate, doubling in the third and eventually scoring on a Rhys Hoskins single to center. Velasquez has a 1.35 ERA over his last 33 1/3 innings, including six starts and one relief appearance that came in extra innings. He's maturing into a reliable arm in a rotation that's been outstanding for much of the year. "He was efficient, he was calm, and he was poised throughout," said Phillies manager Gabe Kapler of Velasquez. "The last month has been really impressive." The Phillies pushed their lead to 2-0 in the seventh as Cesar Hernandez worked a walk and eventually crossed the plate on a wild pitch. The Marlins threatened in the eighth, but Seranthony Dominquez was able to put the fire out as the Fish pushed just one run across the plate. The victory enabled the Phillies to maintain a half-game lead over the streaking Braves who won their fifth straight contest on Friday. The night though belonged to Velasquez. "Today I really worked on getting ahead of guys and putting them away," Velasquez said. "Still having that aggressiveness and challenging the hitters." The two clubs resume their set on Saturday as Zach Eflin squares off against Jose Urena.